This summer brought with it plenty of sweltering heat and an outcropping of icy treats on a stick for relief. With all the press they’re getting lately, frozen pops appear to be the latest trend. It’s peculiar how life cycles; everything once old and nostalgic is eventually new and hip again. This is fantastic news for the home cook who doesn’t have the patience or the dedicated appliance needed to whip up a batch of gelato or semifreddo or ice cream. 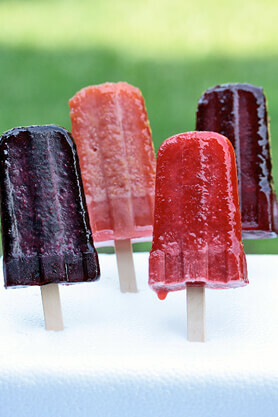 Making popsicles is easy and requires no special equipment! The recipe guide below calls for just five simple ingredients. Adding Arbor Teas organic loose-leaf tea to the pops adds a whole new flavor dimension and an extra level of refreshment. Upon freezing, the tea flavor truly comes forward of the fruit. This is achieved by first making a tea-infused simple syrup. You could stop here and use the chilled syrup in cocktails or more casual summertime beverages, or you could forge on by adding fruit and freezing it on a stick. Wide grins are your guaranteed reward for just these few extra measures. The flavors of pops I’ve made so far include: Peppermint-Blueberry, Crimson Berry Fruit Tisane-Cherry, Pineapple Passion Green Tea-Strawberry, and Raspberry Green Tea-Peach. Purposefully, though, this recipe is specific about ratios and vague on flavors. I’m leaving it to you to peruse the Arbor Teas selection and be inspired by what’s available at your local fruit stands. And don’t be deterred if you don’t own frozen pop molds. Try the tricks outlined here for a simple substitute. In a medium saucepan, heat the water to boiling. Remove from heat, add the tea leaves, cover the pan, and allow the tea to steep for 5 minutes. Strain to remove the leaves. Return the freshly brewed tea to the saucepan and bring to a slow boil. Add the sugar, stirring constantly until it completely dissolves, about 2 minutes. Add the fruit to the tea-infused syrup. Gently boil the mixture until the fruit is soft, stirring occasionally, about 5-8 minutes depending on the type of fruit. Remove from heat and pass the mixture through a food mill (or strain through a mesh sieve) set over a bowl, pressing on the solids to extract as much fruit as possible. Add the lemon juice to the fruit puree mixture and stir to thoroughly combine. Cool to room temperature and then divide the mixture among the ice pop molds. Freeze until semi-firm (~2 hours), insert popsicle sticks, then continue freezing until completely solid, at least 8 hours or overnight. To release pops for serving, dip the bottoms of the molds in warm water for 10-15 seconds.